Lake Tahoe will be the setting for a new movie about a monster shark. 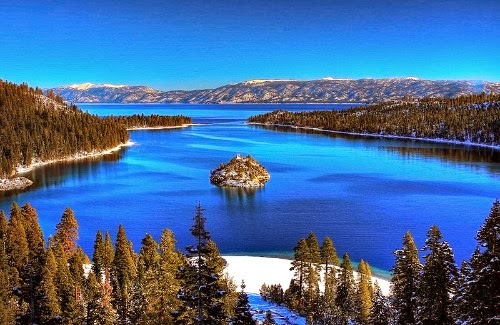 Lake Tahoe and the Reno area will serve as the landscape for a new movie with the working title "Shark Movie," according to the producer. It will feature a beast that causes its share of trouble in the famous tranquil mountain lake. According to an Associated Press report, Jerry Spilman, with Reno-Tahoe Studio, will be the producer, and Jerry Duggan, another Lake Tahoe-Reno area resident, will be the director. The actors and actresses in the movie haven't been announced, but the producer said the stars will be "names you recognize." Spilman's Reno Tahoe Studios opened in August at the Reno Sparks Convention Center. He's hopeful of an increase in business after a bill Nevada Gov. Brian Sandoval signed earlier this year granting a 19 percent tax break for filmmakers who shoot their movies in Nevada. The tax break begins Jan. 1, 2014. Christopher Baume, president and CEO of the Ren-Sparks Convention and Visitors Authority (RSCVA), said the tax break will allow the state to compete for billions of dollars of movie and television productions that have been lured to Louisiana, Georgia, Michigan and other states with similar incentives. Actor Nicholas Cage visited Sparks, Nev. in recent months to give his support for the bill. I hear Dolph is currently working on a film about deadly sharks in Lake Tahoe. the film is called "The Lake". However, since he lives in Marina Del Rey where thousands and thousands of fish were found dead, floating on the surface of the Marina in May 2014 and officials were very secretive as to why they died, couldn't Dolph whose a chemical engineer find out what toxins have been released in the Marina and make a film about it called "The Marina". He could have a role like Julia Roberts in Erin Brocovich!! !